Shopping for Transformers Construction Toys? Thirty favorite Transformers characters get totally tubular treatment in this special edition set that celebrates the Cybertron Class of '85! 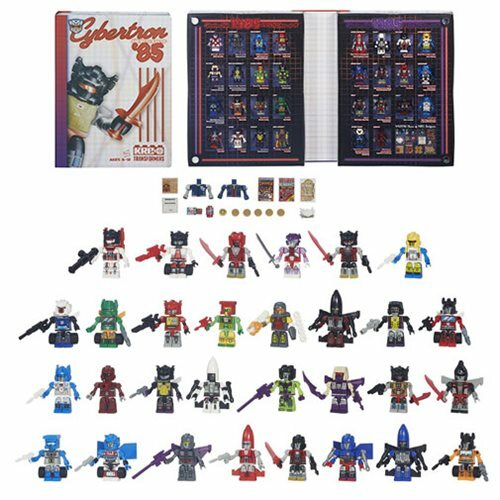 The Kre-O Transformers Cybertron Class of 1985 Yearbook - Convention Exclusive features 30 amazing Transformers characters. Each character in the set debuted in 1985's second season of the Transformers animated series. The set features fan-favorite characters like Devastator, Grimlock, and Omega Supreme, as well as the KREON debut of Astrotrain, Jetfire and more. Get the figures ready for their laser-background yearbook photos with awesome '80s KREON accessories like a denim jacket, custom feathered hairdo and a prophetic Sports Almanac! It all comes packed in collectible yearbook-style packaging that's ready to display. Includes Alpha Trion, Astrotrain, Beachcomber, Blaster, Blitzwing, Bombshell, Cosmos, Devastator, Dirge, Grapple, Grimlock, Hoist, Inferno, Jetfirfe, Kickback, Omega Supreme, Powerglide, Ramjet, Red Laert, Seaspray, Skids, Slog (Sludge), Slug, Smokescreen, Snarl, Strafe (Swoop), Thrust, Topspin, Tracks, and Warpath - plus cool bonus accesories, in case you needed more incentive! Ages 6-12.